In common with most Asian societies, the people of the Malay world attach great importance to decorated textiles. Apart from obvious applications - garments and other items of practical use - fabrics often have significant symbolic value, expressed by the colours and ornamentation used for their design. Patterns may have ceremonial or religious functions, or indicate the power or status of the owner. Apart from the design, the materials used can also play a role in this respect; damask cloth or silk will be more highly regarded than plain cotton, and additional embellishment, such as the use of gold thread or gold leaf, is an obvious sign of wealth. 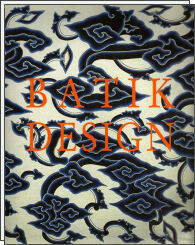 Among the most prominent and highly developed decorated textile types in Southeast Asia is batik. The batik sarong and kain panjang, skirt-like garments worn by men and women, have for centuries been - and in rural areas still are - the most prominent dress items in the Malay wardrobe. The finishing of the sarong may vary from a single colour applied to rough, homespun cotton, as worn by village people in parts of Java, to intricate designs executed in many colours on high-quality imported cotton, sometimes with additional decoration in gold leaf. In other instances batik is also used for the decoration of exclusive silk garments. However, many batik designs have particular symbolic meanings and are not intended for everyday use; rather they are reserved for certain important functions and ceremonies. So in some regions young boys will be dressed in special batik motifs during and immediately after circumcision - an important milestone in a man's life; these designs are thought to have the ability to still pain. Often batik is an important part of bridal attire. Newly weds are regarded as king and queen on their wedding day, and so might be dressed in designs once reserved for royalty. Specific batik cloths may also have a ritual function during pregnancy, childbirth and burial.